Blood and Guts – Complete Lapbook on Video! What kind of teacher would I be if I didn’t let the younglings dissect an eyeball, since we’re on the senses? A bad one, that’s what. I can tell you that I wasn’t in there, because under no circumstance is my mental well-being worth anyone dissecting an eyeball. Just these pictures make me want to crawl out of my skin! So, I had another teacher take over for me (I took her engineering class), and she rocked it (ahem – as did I, with her class)! Grody to the MAX (no offence to my student, Max…)! Although, Max was pretty dang grossed out (along with a couple of others). This is HANDS-DOWN the BEST eye dissection walk-through I found. I wish they had it for the rest of the body parts we dissected! Yay for the senses! This is always a fun chapter, no matter what your age. Our senses are what allow us to experience life, and kids are really curious to know how to use them and explore them. We’ve been using Apologia’s Exploring Creation with Human Anatomy and Physiology to make this gigantic lapbook, and it looks like we’ll only be able to get through Lesson 12 before school’s out. Oh well. Most of the content has been covered, and it gives them a good foundation for the future, when they’re ready for high school biology. For this section, we used the eye and ear model from Scholastic’s The Body Book, by Donald M. Silver and Patricia J. Wynne. 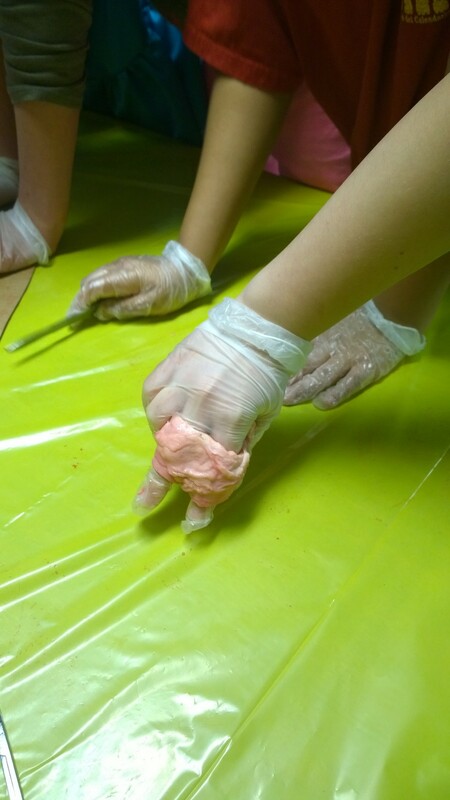 We also used the smelling model and the tongue-and-lips model from Scholastic: Easy Make & Learn Projects: The Human Body. I copied the eyeball diagram from Knowledge Box Central (I think it’s page 39). I also made up a lot of cards and foldables, and you’re welcome to download them below. You’ll also notice cards in the lapbook from our “Sensory Extravaganza.” That was a super-fun day, full of experiments and activities devoted to our senses! L11 Lapbook – Why doesnt everything have a smell? The first part of the open lapbook. The cards you’re seeing in the middle are part of the Sensory Extravaganza. The top part is flipped up. The top part is opened to the left, revealing the ear model. The tongue model is folded and under the “tongue jobs” card. The bottom part is flipped down, revealing the eye model. Here you can see the rest of our Sensory Extravaganza cards. The bottom right is opened, showing the eye model. On the right, the folded card is the smelling model, with another foldable glued on top. Here we go with Lesson 10! Lesson 10 is about the brain’s different parts. Hey, what does a vegan zombie eat? GrrRRraaAaAaaiIIiiiiNNnnnnssss! Ha! This coincides with Apologia’s Exploring Creation with Human Anatomy and Physiology. You should really check out the other sections we’ve done. It’s ridiculous… And we love it. For this section, I used parts from Scholastic: Easy Make & Learn Projects: The Human Body, and made up the rest. If you want to see how far we’ve come, here are the links to the rest of the lessons we’ve done that coincide with Apologia’s Exploring Creation with Human Anatomy and Physiology. These things are becoming so huge, we’ll need a tub to carry them home! Maybe I’ll post a video on how they all open, so you can see how nuts it is. There wasn’t a lot to be done, as far as experiments or activities, but we still had fun. I walked them through how to make a beaded neuron, and that was pretty cool! The boys especially loved it – go figure. The best instructions I found for the neuron was here. You can see our beaded neuron below, in the lapbook pictures. It took an entire class time to make them, but that’s ok. They’re really cool! Annnnnnnnnd, now for the parts! How about another gruesome dissection, starring the 6th/7th grade Blood and Guts class? Of course! We started out with two cow hearts. I love working with cow parts, because if you can only get one or two of them (like us), they’re nice and big enough for everyone to see, experience, and participate. 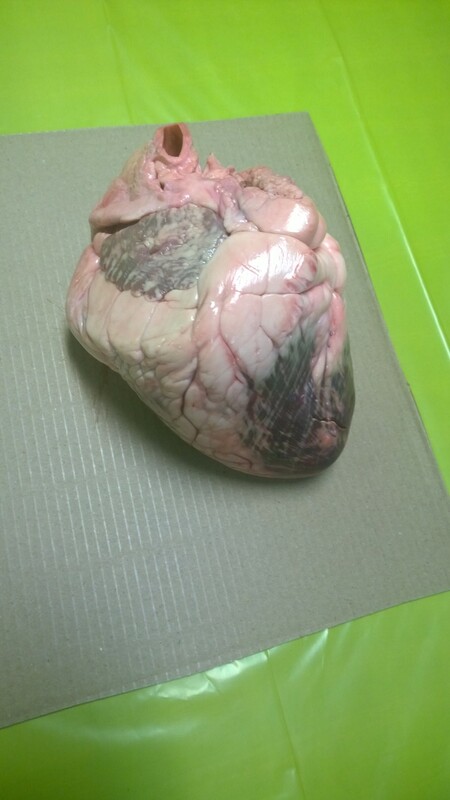 Then we started hacking away to find all the interesting heart-parts. We took turns, because there are always ones who like to cut and get their hands in, and others who would rather be at home watching TV watch.